While huge amounts of foreign currency is being spent on US real estate, not every property type is benefiting from it or is appealing to an international buyer. Generally, foreign buyers who aren’t residing permanently in their New York homes tend to gravitate exclusively to new developments and crave movie-like views, a footnote not fully understood by condo owners who are re-selling their homes into a market with greater luxury new-development options than five to six years ago. Additionally, there is an assumption by sellers of downtown condos, for example, that international buyers will snap up their $2.5 to $4M homes. I recently conducted a deeper analysis of the Chelsea 2-bedroom re-sale market, focusing on closed sales from March 2014 to March 2016. The results are eye opening. Contrary to popular belief, only about 20-25 percent of the buyers were from outside the New York area or a foreign country. 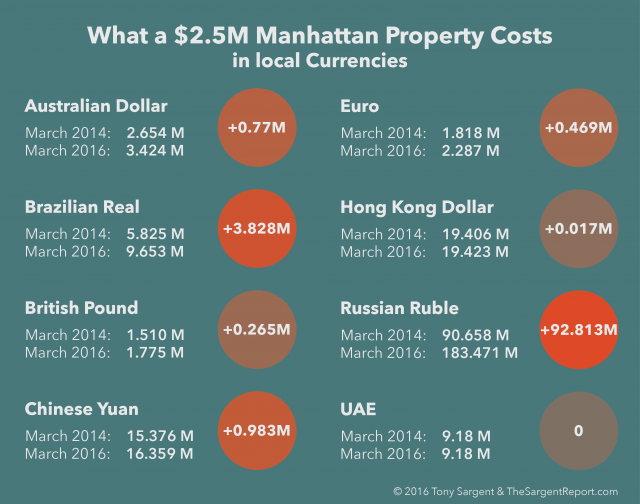 More importantly, for foreign buyers, the cost of a $2.5 million dollar Manhattan home has fluctuated wildly in local currency depending on where a buyer is from. These fluctuations are impacting buyers’ feelings of wealth and buying decisions. Bottom line: Investors from China and Hong Kong appear to have the strongest hand when it comes to the rising cost of a New York property based on currency rate fluctuations. 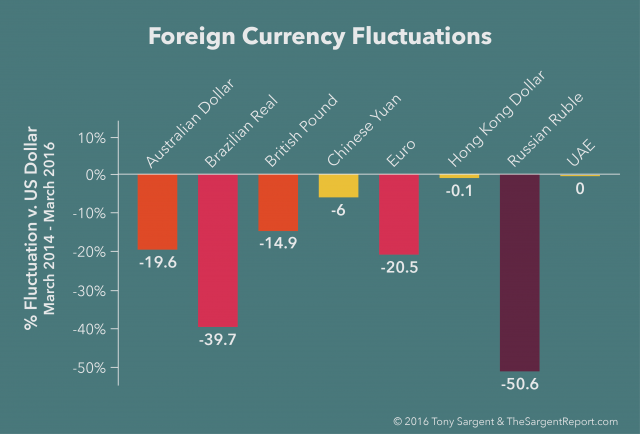 Russians and Brazilians have been hurt the most from a currency fluctuation standpoint, and that’s not even taking into account the economic factors affecting wealth in those nations. What factors are influencing foreign buys in Manhattan right now? What price points are most impacted positively or negatively? What myths are adversely impacting how sellers and agents price property? Manhattan’s luxury market is stabilizing, but some properties are taking longer to sell now than in 2014. Unfortunately, misconceptions about international buyers continue to impact seller and broker marketing tactics, which can ultimately hurt sellers’ ability to land top dollar for their properties. A complete understanding of foreign buyer preferences and currency fluctuations is essential to successfully marketing luxury properties for sale.